My friend and I hosted dinner for 14. It was a fun evening; everyone brought something, so it wasn’t too much work for anyone. We had a great salad and a baked potato bar (with all kinds of toppings: chili, cheese, bacon bits, sour cream, chives, BBQ chicken!) My contribution was dessert and Sangria. You’ll love my sangria recipe! I said to someone, as we were filling our glasses, that I have a PhD in Sangria. OK, it might be more accurate to say I did four years of “research in the field” while we were in Spain. 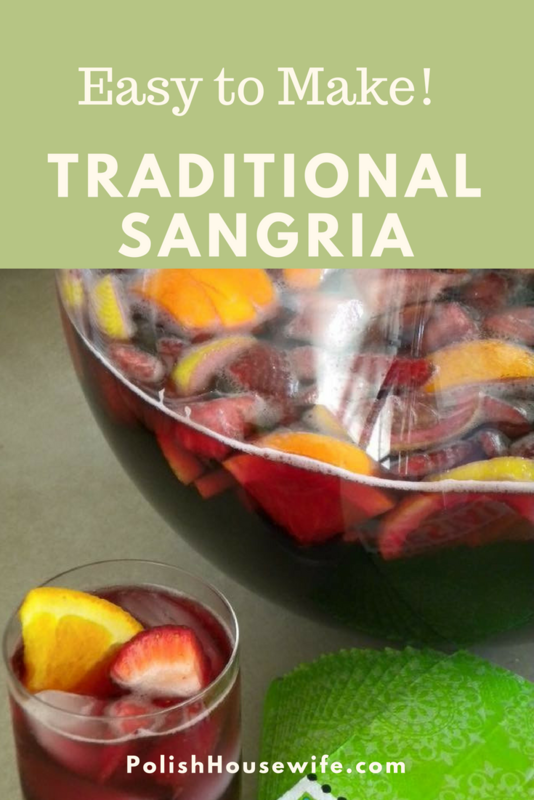 The most unusual Sangria I had during that time was prepared by a Spanish bullfighter; he added gin to the wine and included sliced bananas in the fruit medley. It’s such a refreshing drink, and it offers such flexibility! It can be made with red or white wine, I like both, but I think red stands up to the other flavors better. If you enjoy this recipe, how about rating the recipe in the comments below, sharing the love and passing it on to your friends? 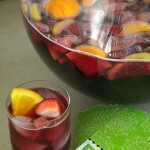 PS – This makes enough for a punch bowl, but you can make 1/3 of the recipe and serve it in a pitcher. The following are affiliate links, which means that if you make a purchase, Amazon sends me a few cents. PS – to my food blogging friends, I’ll point out that I saved (kept out) an orange slice and a strawberry when adding the fruit to the punch bowl. The two, clean piece of fruit were placed on top of the glass in the photo as recommended by Adam Pearson at a recent food blog seminar. That way, the fruit was very visible and looked perfect, not stained by the wine or smashed (no pun intended) in any way. Looks great! Makes me ready for summer. Hi Veronika! I add the fizzy stuff to the punch bowl or pitcher. Hi. The recipe makes such a big batch. Do you know if I can freeze and reconstitute it with fresh fruit later? For a small batch, just use one bottle of wine, or half a bottle, and reduce other ingredients proportionally. Thanks for asking! Should the red wine be a little sweet, or maybe not sweet at all, or does it even matter? If the wine is sweet, I would add less sugar. I normally use cheap, dry wine. Cheap being the key word. You’re adding so much to it that it would be a waste to use a good wine. 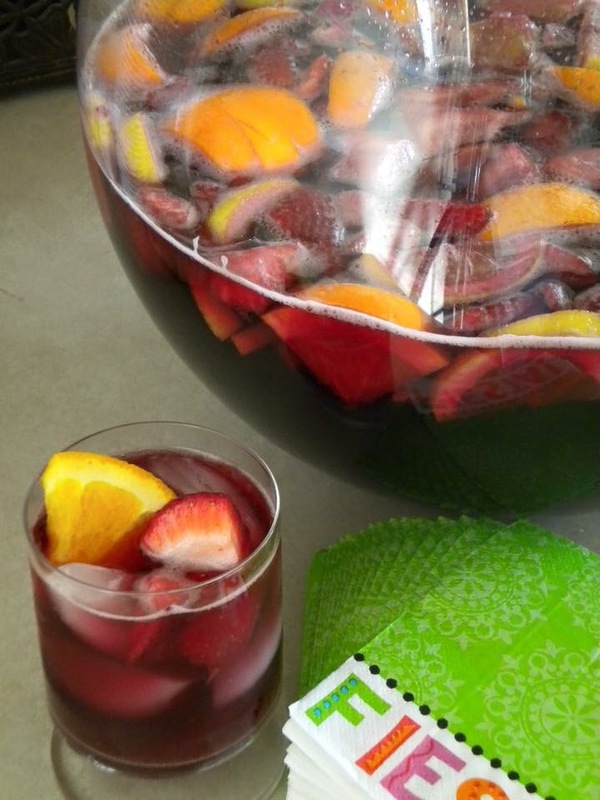 This recipe makes a delicious sangria. Love it! What a refreshing recipe, Lois! Can’t wait to try it! 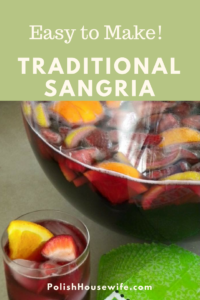 Love this recipe of sangaria.. i can’t wait to try it..
A great tasting summer drink.